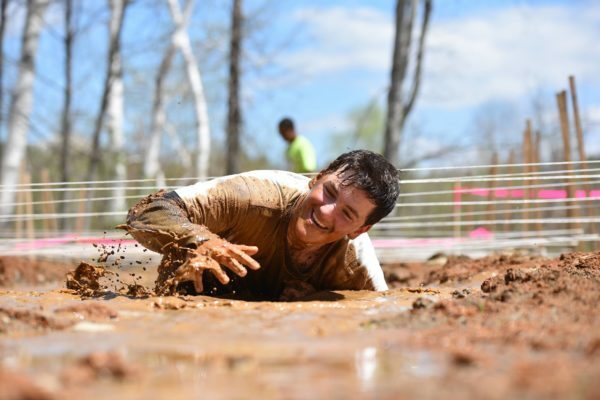 Aaron Sixberry, a student of the East Grand Outdoor Education Program, crawls through a mud pit as a part of the 2016 East Grand Adventure Race in Danforth. 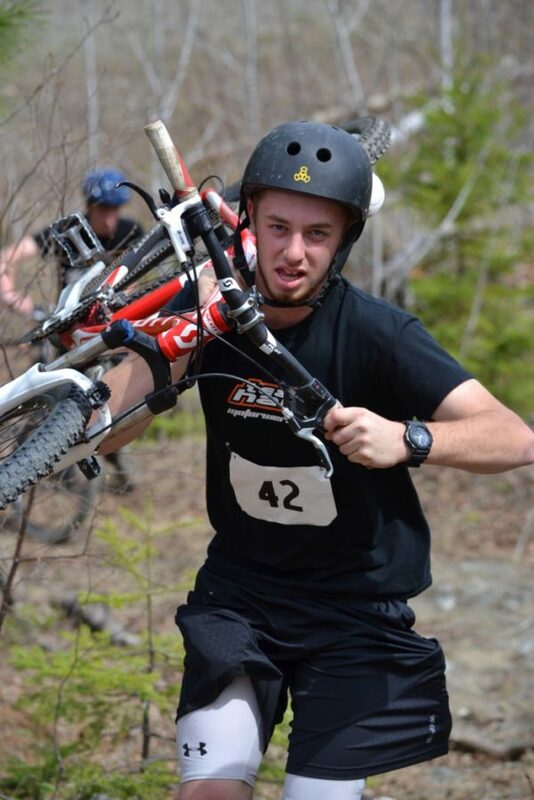 Ben Humphrey of Pownal carries his mountain bike during the 2016 East Grand Adventure Race in Danforth. 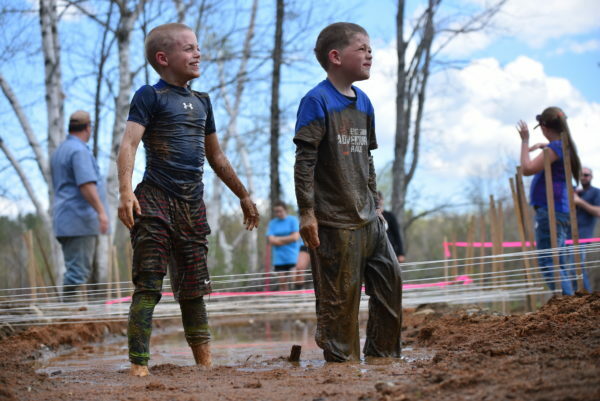 Philip Espenscheid (left), 7, of Brookton, and Cooper Scott, 8, of Merrill, complete together in the mud crawling challenge during the 2016 East Grand Adventure Race in Danforth. Their participation in the race spurred the creation of the new family-mentoring division, a condensed version of the race includes the compass run and paddling only legs, leaving out the biking leg. 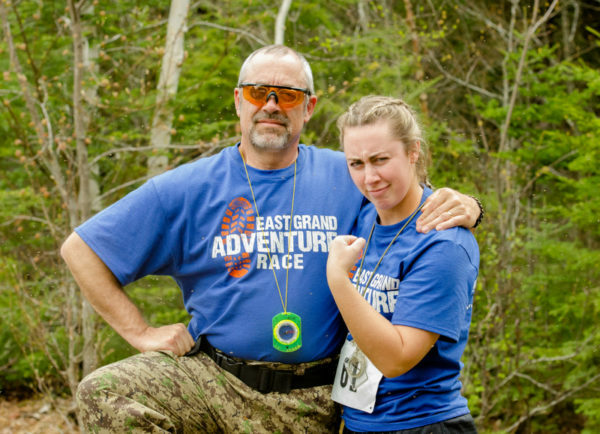 Father-daughter team Bob and Helen Humphrey of Pownal, pose for a photo during the East Grand Adventure Race in Danforth in the spring of 2016. The race will begin with a dash through the forest, an off-trail run navigated by compass. It will end with a long paddle down Baskahegan Stream. And along the way, participants will bike, scale a wall, crawl through a mud pit and identify trees. The East Grand Adventure Race, slated for May 13, is a challenging combination of outdoor skills, physical endurance and teamwork. And for more than a decade, this outdoorsy triathlon has become a spring highlight for the small rural town of Danforth, Maine. In recent years, the race has drawn between 60 and 70 racers. About 40 local volunteers from Danforth and nearby towns, including the Danforth Fire Department and Dirigo Search and Rescue, help run the event. In many places, the race would be considered a small event, but in Danforth, located on the northeast border of the state, it makes an impact. The town’s 2010 census recorded less than 600 residents, and the town’s East Grand High School currently has about 50 students. “I see it as important for bringing the community together,” said race organizer Dave Conley, pointing out that that it’s also an economic boost for the community. Racers from out of town often stay at the First Settlers Lodge in Weston and spend money at local gas stations and eateries. The East Grand Adventure Race, kicking off at 8:45 a.m. on Saturday, May 13, will comprise of a 1-mile compass run, a 10-mile mountain bike course, a climbing wall and a 8-mile paddle down the scenic Baskahegan Stream. The race will also include a number of challenges, including mud pit crawling, log rolling, a paintball challenge to hit moving targets, and an environmental station where you’ll need to identify five evergreen branches. Also on that day, the community will host a 35-mile canoe and kayak race on the Baskahegan Stream. This lengthy water race was added to the festivities about five years ago to cater to people who were only interested in paddling. The Adventure Race has nine divisions: pairs of high school boys, girls and mixed; pairs of adult men, women and mixed; junior-senior pairs; open (can be a relay team, solo or teams of any size); and new this year, a family-mentoring division that will only compete in the compass run and paddle, not the biking section. This new non-competitive division was created for people who don’t think they are capable of completing the entire course, as well as adults who wish to guide children or teens through the race. Amy Scott and her husband, Matt Scott, who grew up in Danforth, plan to participate in this new division with their 6-year-old daughter and 8-year-old son. “We’re looking forward to that,” said Amy Scott, who says her family may also be completing the paddle portion as the safety sweep, making sure all participants get down the stream safely. Now in its thirteenth year, the East Grand Adventure Race started out as an event for local students to demonstrate all they had learned in the East Grand Outdoor Adventure Program, an elective offered to grades 9-12 at East Grand High School. “When we first started it, we chose to focus on three good lifelong things to have. You can run and bike and paddle when you’re in your 70s,” said Conley, who teaches the East Grand Outdoor Education Program with East Grand High School’s physical education instructor Tammi Matula. In the class, students learn canoeing, map and compass, cross-country skiing, snowshoeing and more. And they are required to take part in a fall overnight canoe trip, a winter camping outing and spring canoe races, including the East Grand Adventure Race. Over the years, the race grew in popularity and organizers opened it up to the public, adding an adult division, as well as the coinciding 35-mile stream race. In recent years, the race has attracted participants from throughout Maine and New Brunswick, including a group of adults and students from Orono. Boss said that the biking leg is the most physically demanding part of the race, and navigating during the off-trail compass run can also be tricky. And in his opinion, the easiest part of the race is the paddling section at the end, which is calm water aside from a section of small rapids at the end. The pre-registration fee is $20 if paid by 1 p.m. Friday, May 12, or you can register for $30 on the day of the event. Check-in is at East Grand High School from 7:30 to 8 a.m. on the day of the race, and the registration fee includes a race T-shirt, lunch and awards. The high school first and second place winners are awarded $100 and $50 gift certificates to Ski Rack, and the same goes for the juniors of the junior-senior division first and second place winners. And all racers are entered into a drawing for a new Vapor kayak, paddle and life jacket, donated by Old Town Canoe. 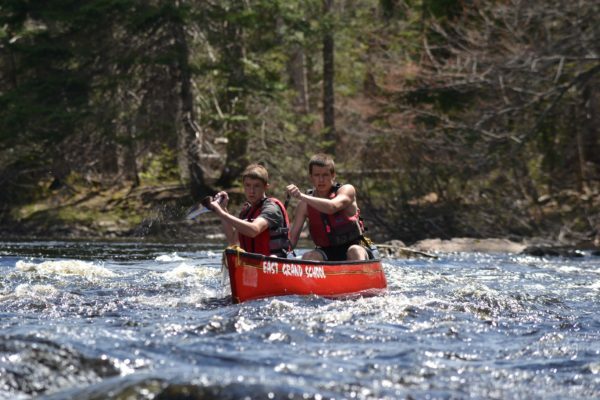 For the 34-mile Baskahegan Stream Canoe Race, check-in is 7 a.m. on May 13, at East Grand High School. The pre-registration fee is $20 if handed in by 1 p.m. Friday, May 12, or you can register for $30 on the day of the event. 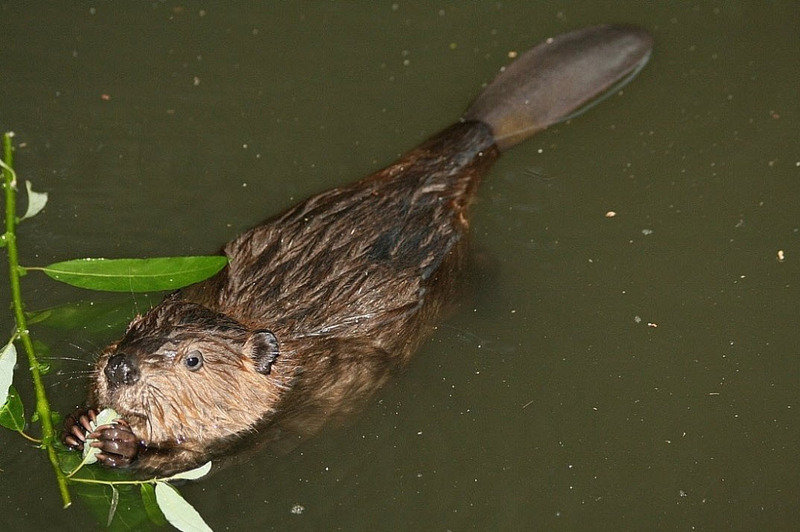 For information about the race, call Conley at 551-8729 or email him at dave@canoethewild.com. Registration forms for the adventure race and the 34-mile paddle can be downloaded at www.canoethewild.com/east-grand-adventure-race/.